International research team recasts timeline, dating from the Big Bang, of possible quantum theory alternatives. When it comes to fundamental physics, things can get spooky. At least that’s what Albert Einstein said when describing the phenomenon of quantum entanglement—the linkage of particles in such a way that measurements performed on one particle seem to affect the other, even when separated by great distances. “Spooky action at a distance” is how Einstein described what he couldn’t explain. Schematic of the 2018 “Cosmic Bell” experiment at the Roque de Los Muchachos Observatory in the Canary Islands, where two large telescopes observed the fluctuating color of light from distant quasars (red and blue galaxies). The green beams indicate polarization-entangled photons sent through the open air between stations separated by about one kilometer. Image by Andrew S. Friedman and Dominik Rauch. Diagram of a run of the Cosmic Bell test. 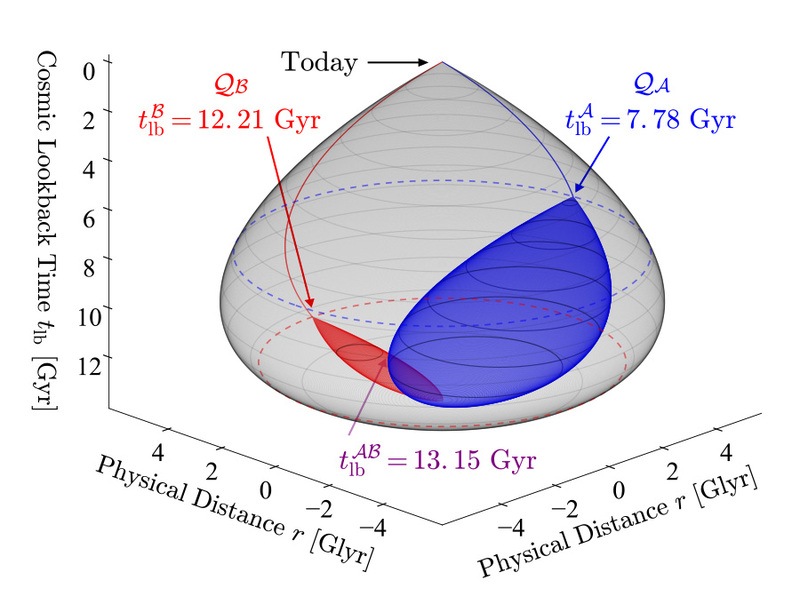 The regions of space and time where an alternative, non-quantum mechanism could still have acted (limited to the red and/or blue regions) corresponds to at least 7.78 billion years ago (blue region). Light from the more distant quasar was emitted 12.21 billion years ago (red region). Compared to the gray region, representing all of space and time prior to the experiment, the alternatives are limited to within four percent of the space-time volume since the Big Bang. Image by Andrew Friedman and David Leon. Besides UC San Diego’s Friedman and Leon, the full research team included lead author and Ph.D. student Dominik Rauch, along with Anton Zeilinger and his experimental quantum optics group from the University of Vienna; theoretical physicists David Kaiser and Alan Guth at MIT; Jason Gallicchio and his experimental physics group at Harvey Mudd College, and others. Expanding upon their previous quantum entanglement experiments [Physical Review Letters], Friedman and colleagues went to great effort to choose entangled particle measurements using 3.6 and 4.2 meter telescopes in the Canary Islands, allowing them to collect sufficient light from the much fainter, distant quasars.